A Fun Take on TechChange Final Projects: A Blockchain Party! We wrapped up our first Blockchain for International Development course in February and recently had a chance to sit down with Maputi Botlhole about her experience in the course! Maputi is from Port Elizabeth, South Africa, and has over 3 years of international work experience at the intersection of global health, technology and supply chain management. She worked as a Program Officer on the USAID | DELIVER Project and is also the Co-Founder of MAISHA Innovate. When coming to this course, she was most interested in the application of blockchain technology in global health. 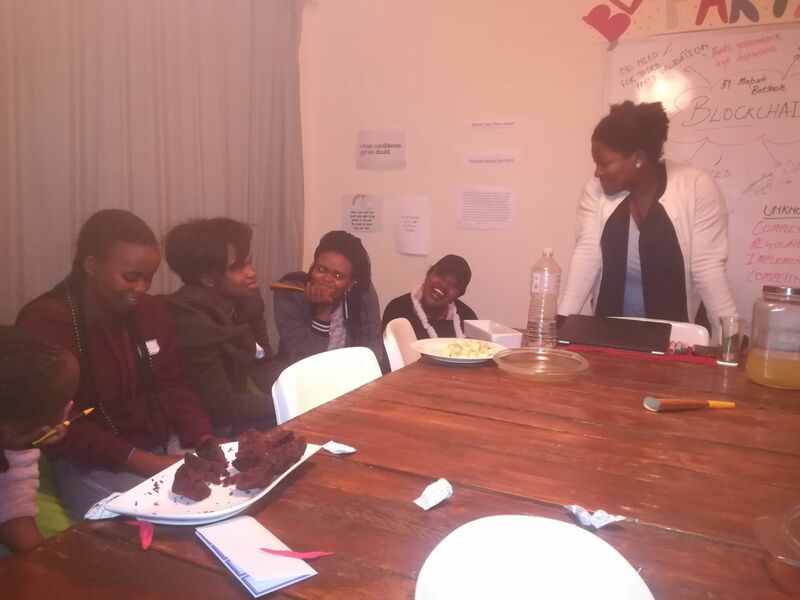 She also wanted the course to help her think creatively about how to apply blockchain technology in the township economy space (South Africa). Q: How did you find out about the TechChange course Blockchain for International Development and what inspired you to take it? At the time, I thought about learning something new in the upcoming year, hence the email enticed my curiosity and I proceeded to open it. The course: Blockchain for International development, was the first listed course offering for the year 2018. I was hesitant to immediately sign-up, however, I kept the thought of enrolment at the back of my mind. We ushered in the new year, and days later I received a notification from ICT4Drinks. The notification was for the “Block Party Edition,” which served as a good reminder to sign up for the course on “Blockchain for International development.” We are inundated with information on the cryptocurrency applications of blockchain, and this was the first time I’d come across learning about the technology within the context of international development. The potential to use the technology for social good coupled with the $50 “BlockParty” discount peaked my interest and provided an extra nudge to enroll for the TechChange course! Q: What did you enjoy most about the course? The course did a great job of taking students through the fundamentals and applications of blockchain technology. The participants in the course were from different corners of the world ranging from Little Rock, Arkansas to Suva, Fiji to Lima, Peru! The course content and the manner in which it was delivered made blockchain technology accessible to myself as a South African, and accessible to participants from other geographical locations. The diversity of the course participants was a testament to the global footprint of TechChange and added a cross-cultural flair to our discussions on blockchain technology. At the same time, I learned about blockchain as a technology that has applications beyond cryptocurrency – yes, digital currency is important. I even set up a wallet and exchanged stellar lumens through the course, however, the blockchain demo and other visual material from the course effectively described the underlying technology of blockchain. I now know that blockchain is a decentralized, distributed and incorruptible public ledger that records any transaction of value – whether that value is in the form of digital currency, smart contracts in land titling, votes in the electoral process, or any item that can be tokenized – with no requirement for third-party validation. This expanded my understanding of the technology. In addition, the case studies and live events; which featured guest speakers, discussed blockchain topics ranging from how applications powered by blockchain are being used to create economic identities for “unbankable” farmers in remote areas; to how blockchain technology is used to provide data integrity on supply chain operations. An interactive slide from TC116: Blockchain for International Development on various blockchain applications. I enjoyed learning about the several application of blockchain through this course! Furthermore, the discussions on the future of blockchain helped me to think creatively about the applications of such a technology in South Africa. I even found myself seeking out events that spoke to the use of blockchain in South Africa. This was to the point where I ended up attending the 2018 Africa Energy Indaba. The “Indaba” was held in Sandton City, Johannesburg and one of the panel discussions spoke to the democratization and deployment of renewable energy through blockchain. So even though this was an online course, it coalesced in a way that encouraged me to get away from the computer screen and go out into the world to learn more about blockchain technology. Q: What‘s one thing people should know about blockchain? This is a technology that is accessible to all of us! We can dedicate time and resources to learn about blockchain through platforms such as TechChange; partner with others to use the technology to creatively solve some of the pressing global challenges. I was inspired by the case studies which documented and highlighted blockchain projects for social good! Q: Tell us about the block party you organized, sounds like a great event! 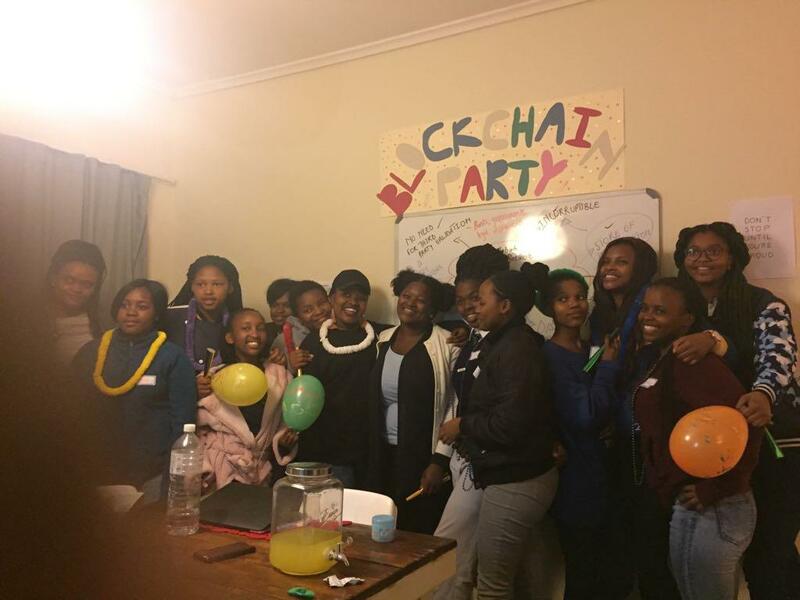 On the evening of April 20th, 2018, I held a “BLOCKCHAIN PARTY” in a South African town called Grahamstown. This town is located in the Eastern Cape region of the country and it is predominantly “Xhosa” speaking: the Xhosa language is internationally known as the click language and it’s also spoken in the fictional country of “Wakanda” in the Black Panther movie. I was surprised to have at least 20 female high school students show up for my party. Most of the students were from an academic excellence residence known as Maqubs Academy. The high school students ranged from 15-18 years in age and even though they could’ve been pre-occupied by other activities that evening, they all were eager to learn about blockchain technology. I had party lanyards, name tags, party whistles, beaded necklaces, refreshments and 50 balloons to liven up the atmosphere. Each balloon had an interesting fact or questions about blockchain inside that I had written on a piece of paper. I also had some South African “GQOM” house music playing in the background. The participants walked in, wrote their names on provided tags and put on the lanyards. The blockchain party started at 18:30PM SAST and I introduced myself. I shared on the expected participation conduct/norms. For instance, one of the norms was for the attendees to blow their party whistles whenever they had a question, and each participant was required to pop a balloon every 5 minutes to read a fun fact on blockchain for the entire group. I then asked the participants to share their expectations for the blockchain party. The participants also inquired about my background with blockchain and proceeded to tell them about my learning experience on the TechChange platform. The discussions at the party leaned on the roundtable format with myself as the facilitator. It was important to make the interactions conversational in order for the participants to feel comfortable, and confident enough to engage with me on this topic. I had a whiteboard where I mind mapped and highlighted the general aspects of blockchain. I also drew a table to present the advantages and unknowns of the technology. The discussions kicked off with the fundamentals of blockchain technology: what it is, how it works and its applications. I took the participants through the blockchain demo. They did have some knowledge on bitcoin as a digital currency due to the buzz bitcoin had recently created in the South African news cycle, markets and on social media. However, the participants didn’t know that blockchain technology can be applied to other areas such as healthcare, energy, remittances, land titling, etc. Their understanding of blockchain expanded once I explained the underlying technology and shared information on the case studies that I had discovered through the TechChange course. I will mention that the students were a bit taken aback by the thought of a technology that doesn’t require third-party validation (banks, government, legal institutions, etc) and started to ask a lot of questions (trust and corruption was a big issue). Of course, we did not forget to pop a balloon every 5 minutes to read the fun facts – these fun facts also included notes on case studies which helped to enliven the discussions and provided clarity on some of the questions. We discussed case studies ranging from BanQu to Blockcerts. We then had a Q&A session, and the party ended with the participants telling me about how they plan to share the information they had learned during the blockchain party. One of the students said she would introduce blockchain technology as a debate topic at her school, another student said she would take the time to learn more about freight forwarding applications of blockchain, and another student said she’d also host a blockchain party with her friends! Unfortunately, it got late and we couldn’t pop all 50 balloons but the participants took the remaining balloons with them! 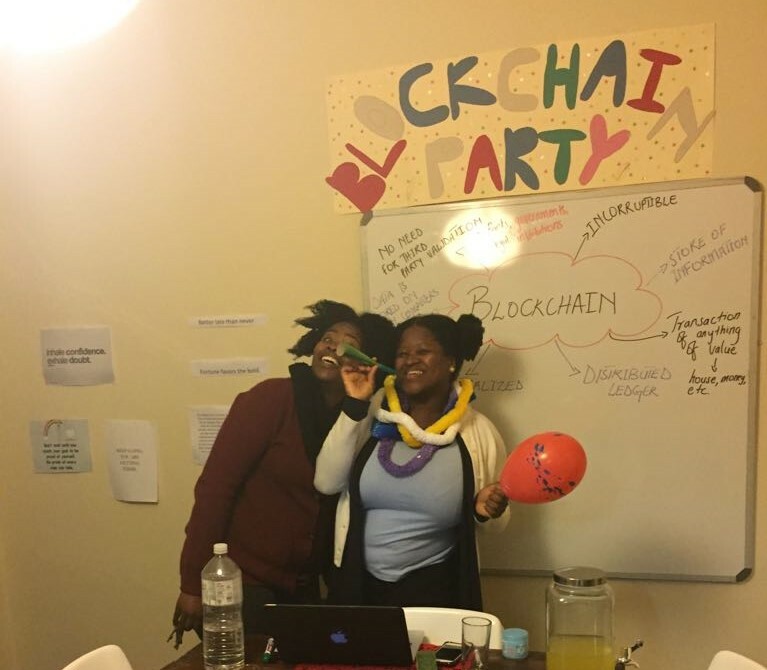 The blockchain party was a success and it got me thinking about the possibility of organizing more blockchain parties for high school students in South Africa! I even heard that a high school in Johannesburg, called the African Leadership Academy, had conducted their student government elections on the blockchain. It would be interesting to discover and document how young people in South Africa are thinking about and using this technology. More blockchain parties in the future!! Thank you Maputi for your creative blockchain party and your contributions to our first Blockchain for International Development course! Interested in taking our Blockchain for International Development course? The next session starts on Monday, September 10th and you can sign up here!